In honor of Black History Month, we bring you Robin D.G. 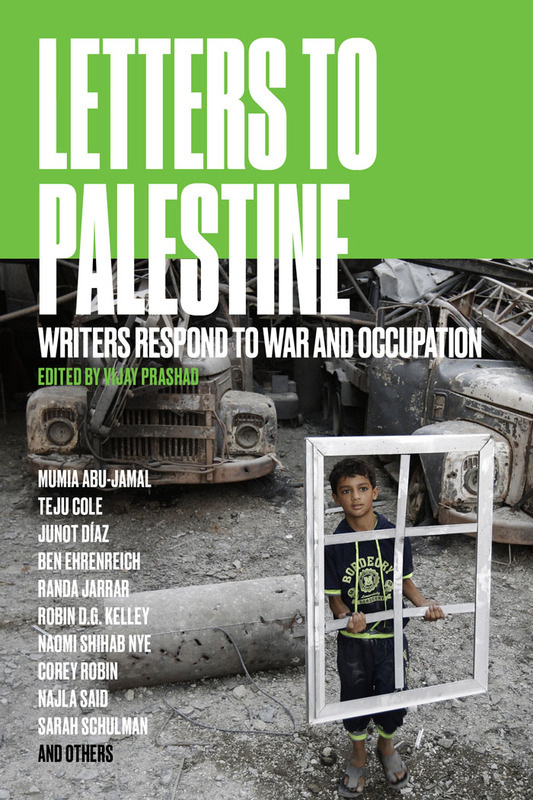 Kelley’s essay “Yes, I said, ‘National Liberation’” from Letters to Palestine: Writers Respond To War And Occupation. Kelley reflects on the links between struggles for Palestinian self-determination and those for Black liberation in the U.S., and traces the ways in which Black radical conceptions of Palestine and Israel have changed over the last six decades. For the past thirty-five years, “Free Palestine” has been etched into my political vocabulary. In the movement circles that nurtured and trained me, “Free Palestine” rolled off the tongue as easily as “Free South Africa,” “Free the Land,” “A Luta Continua,” “Power to the People,” and the ubiquitous “El Pueblo Unido Jamás Será Vencido!” I was a sophomore in college when Israel invaded Lebanon in 1982, in order to drive out the exiled Palestine Liberation Organization (PLO). Two years later, as a first-year graduate student and chair of UCLA’s African Activists Association, I invited representatives of the PLO to participate in our fifth annual conference on imperialism. We received hate mail and death threats from the Jewish Defense League, and the university administration leaned on us to withdraw the invitation. But we prevailed. I completed my doctoral dissertation in 1987, the first year of the First Intifada, and like most of my compatriots attributed Israel’s willingness to participate in the Oslo negotiations to Palestinian resistance. Although Oslo proved to be a disaster and a betrayal of the PLO’s founding principles, we saw the prospect of direct negotiations as a small step toward an elusive national liberation. Yes, I said “national liberation.” Liberals wished for “Peace in the Middle East.” We radicals regarded the PLO as a vanguard in a global Third World struggle for self-determination traveling along a “non-capitalist road” to development. Palestine stood on the frontlines in a protracted battle against imperialism and “settler capitalism.” Palestinians weren’t victims — at least not in my political world. They were revolutionary combatants and, thus, models for those of us dedicated to Black liberation and socialism. Three decades later, in the wake of the incalculable devastation caused by Israel’s latest assault on Gaza, solidarity with Palestine appears stronger than ever. In every corner of the United States, people took to the streets and to social media to condemn so-called “Operation Protective Edge,” Israel’s latest genocidal assault on Gaza. Palestine solidarity activists built bridges with prison abolitionists, immigrant rights activists (under the banner “Stop the War on Children From Gaza to the US/Mexico Border”), labor (in the Block the Boat demonstrations), and most spectacularly with the struggle against racist police violence in Ferguson/St. Louis, Missouri. What drives most of these acts of solidarity, however, is empathy for Palestinian suffering and/or recognition of common experiences of oppression. Spectacular violence is guaranteed to generate condemnation, which explains why outrage tends to ebb and flow with Israeli military incursions, rising precipitously during Operation Cast Lead in 2009, and again when Israeli airstrikes resumed under “Operation Returning Echo” in 2012. The 2014 criminal war on Gaza has thus far produced the most casualties, the most material damage, and the greatest moral outrage. Images of infant corpses and entire families buried beneath concrete rubble generated feelings of anger and sympathy, while propaganda efforts to portray Israelis as vulnerable, terrified victims of Hamas rockets largely backfired. Thanks to fearless journalism and relentless activism, spectacular violence in Gaza and the West Bank has swelled the ranks of the Boycott, Divestment and Sanctions (BDS) movement, largely because it offers a tangible, ethical, nonviolent strategy to challenge occupation, the slaughter of civilians, and Israel’s egregious violations of international law. Even when the movement’s financial impact is minimal, the educational effect has been enormous. Thanks to years of sustained, protracted debate, the public knows a lot more about the occupation, who profits from it, and the historical roots of dispossession going back to 1948. During the bloody summer of 2014, I encountered more and more people in the United States openly describing Gaza as the largest open-air prison in the world, citing the fact that our taxes subsidize Israel’s garrison state to the tune of 6 million dollars a day, criticizing the US for consistently vetoing UN resolutions condemning Israel’s human rights abuses while violating our own Arms Export Control Act prohibiting the use of US weapons and military aid against civilians in the occupied territories. Even a few American liberals no longer see the question of Palestine as an Arab-Israeli “conflict” rooted in some ancient, irreconcilable hostility, but rather as a colonial occupation and violation of international law and human rights, subsidized by the United States. Then in August, as the war on Gaza rose to the top of the news cycle, so did the escalation of racist police violence in the US. The killings of Eric Garner, Ezell Ford, Kajieme Powell, John Crawford III, and most significantly, Michael Brown of Ferguson, Missouri — all unarmed, all in the space of a couple of months — were immediately linked to events in Gaza. The people of Ferguson who took to the streets to decry Brown’s unwarranted murder (he was on his knees with his hands up when Officer Darren Wilson fatally shot him) faced down riot police, rubber bullets, armored personnel carriers, semiautomatic weapons, and a dehumanizing policy designed to contain and silence. Activists readily drew connections between Israeli racialized state violence in the name of security and the US — from drone strikes abroad and the killing of Black men at the hands of police—and the role Israeli companies and security forces have played in arming and training US police departments. Palestinian solidarity activists issued statements about the Ferguson protests and the NYPD killing of Eric Garner, and Palestinian activists in the West Bank have put out their own solidarity statements along with advice on how best to deal with tear gas. The Gaza to Ferguson link has been revelatory in other ways. In our lexicon — especially post 9/11 — cops and soldiers are heroes, and what they do is always framed as life-saving, defensive action in the name of public safety. Police occupy the streets to protect and serve the citizenry from (Black and Brown) criminals who are seen to be out of control. This is why, in every instance, there is an effort to depict the victim as assailant – Trayvon Martin, Michael Brown, Darrien Hunt – the sidewalk is a weapon, their big bodies are weapons, they lunge, glare, flail their arms as evidence of threat. In Israel/Palestine, wars of pacification and annihilation are branded as efforts to neutralize the threat of terrorism. The blockade of Gaza is presented as necessary for Israel’s security. People who live under occupation experience the world as victims of perpetual war. Indeed, the police department’s decision to leave Mike Brown’s bullet-riddled, lifeless body on the street for four and a half hours, bleeding, cold, stiff from rigor mortis, was clearly an act of collective punishment. This is the point of lynching — the public display of the tortured corpse was intended to terrorize the entire community, to punish everyone into submission, to remind others of their fate if they step out of line. Collective punishment violates the laws of war, though in this case the Geneva Conventions do not apply. Collective punishment takes other forms as well: routine stops, fines for noise ordinance violations (e.g., playing loud music), fare-hopping on St. Louis’s light rail system, uncut grass or unkempt property, trespassing, wearing “saggy pants,” expired driver’s license or registration, “disturbing the peace,” among other things. If these fines or tickets are not paid, they turn into possible jail time, making bail, losing one’s car or other property, or losing one’s children to social services. The criminal justice system is used to exact punishment and tribute, a kind of racial tax, on poor/working-class black people. In 2013, Ferguson’s municipal court issued nearly 33,000 arrest warrants to a population of just over 21,000, generating about $2.6 million dollars in income for the municipality. That same year, 92 percent of searches and 86 percent of traffic stops in Ferguson involved black people, this despite the fact that one in three whites was found carrying illegal weapons or drugs, while only one in five blacks had contraband. How do the police and the courts get away with this? By criminalizing Blackness, much the same way the Israeli state criminalizes Arab-ness. (Of course, Blackness is also criminalized in Israel, as evidenced in the treatment of African asylum-seekers in Tel Aviv, just as Arab-ness is criminalized in the US post-9/11). In the US, decriminalized Blackness exists as a state of exception — i.e., by portraying the Mike Browns and Trayvon Martins of the world as the undeserving dead, by rendering them good kids, college-bound, honor students, sweet, as if their character is the only evidence they have of their innocence. If we really enjoyed color-blind justice, then even someone with a dozen felony convictions has a right to due process and a presumption of innocence until proven otherwise in a court of law. Of course, Arat-Koç is absolutely right. Western liberals are not pacifists: They are quick to arm “rebels,” so long as they are the right rebels. The innocent child, the grandmother, the widow, are the only Palestinians deserving of liberal sympathies, for they are ostensibly unburdened by political motives, even though they dream dreams of taking back their native land, recovering stolen property, enjoying the rights of citizenship and nationality, and bringing down Israel’s apartheid state once and for all. But what about those dreams? Palestinian dreams? Black liberation dreams? How did we move from a solidarity firmly rooted in the commonalities of resistance to one based almost entirely on the commonalities of oppression? From a radical vision of national liberation, a dream of building a post-Zionist, post-racist world, to a solidarity rooted in shared victimization? How did we come to pitch human rights against self-determination, as if it is an either/or proposition? Are we merely struggling for a long-term ceasefire and the withdrawal of settlements in the West Bank? Are we really fighting for a détente with an apartheid, Bantustan-style “state” ruled by the Palestinian Authority? Are we really fighting for more federal oversight of police, the “demilitarization” of local law enforcement, and a return to the myriad “standard” weapons cops used to kill us in the past? Is our political imagination limited now because the Palestinian Authority is the arm of Israeli state repression rather than the governing structure of a new society? Or is it because Black political power, from the White House to the courthouse, has become the arm of US state repression rather than the leader of an authentic post-racist society? Ironically, as AIPAC-backed, right-wing Christian Zionist organizations, such as the Vanguard Leadership Group (VLG) and Christians United for Israel (CUFI), work furiously to recruit Black students, elected officials, and religious leaders to serve as moral shields for Israel’s policies of subjugation, settlement, segregation, and dispossession, it was precisely the Zionist promise of a new society based on the principles of justice, liberation, and self-determination that attracted such overwhelming Black support for the founding of Israel. This is a complicated story. Black identification with Zionism predates the formation of Israel as a modern state. For over two centuries, the biblical book of “Exodus,” the story of the flight of the Jews out of Egypt and the establishment of Israel, emerged as the principal political and moral compass for African Americans. “Exodus” provided Black people not only with a narrative of slavery, emancipation, and renewal, but with a language to critique America’s racist state since the biblical Israel represented a new beginning. There were exceptions. The iconoclastic writer George Schuyler used his column in the Pittsburgh Courier to criticize the expulsion of the Arabs. “The same people who properly condemned and fought against German, Italian and Japanese imperialism . . . now rise to the vociferous defense of Zionist imperialism which makes the same excuse of the need for ‘living space’ and tries to secure it at the expense of the Arabs with military force financed and recruited from abroad.” Schuyler dismissed characterizations of Arabs as “‘backward,’ ignorant, illiterate and incapable of properly developing the land” as thinly veiled justifications for a Jewish state, reminding his readers that this was the same argument used by the Nazis to invade Czechoslovakia, Poland, and Russia, and to justify European colonialism. Schuyler was not only deluged with letters accusing him of anti-Semitism and downright lunacy, but his own paper rebuked him in an unsigned editorial. The 1967 Arab-Israeli War brought many more African Americans around to Malcolm’s position. The Black Caucus of Chicago’s New Politics Convention of 1967 unsuccessfully proposed a resolution condemning the “imperialist Zionist war,” and the Black Panther Party followed suit, not only denouncing Israel’s land grab, but pledging its support for the PLO. The event that drew the most ire from liberal Zionists, many of whom had been veteran supporters of the civil rights movement, was the publication of “Third World Round-up: The Palestine Problem: Test Your Knowledge,” in the Student Nonviolent Coordinating Committee (SNCC) newsletter. It described Israel as a colonial state backed by US imperialism and Palestinians as victims of racial subjugation. In short, Black identification with Zionism as a striving for land and self-determination gave way to a radical critique of Zionism as a form of settler colonialism akin to American racism and South African apartheid. As a result of SNCC’s article, “responsible” Black leaders were called on to denounce the statement as anti-Semitic and to pledge their fealty to Israel. It was in this atmosphere that Dr. Martin Luther King Jr., made his oft-quoted statement: “We must stand with all of our might to protect [Israel’s] right to exist, its territorial integrity. I see Israel, and never mind saying it, as one of the great outposts of democracy in the world.” Pick up most literature from AIPAC or Stand With Us or CUFI and you will likely see this quote emblazoned in bold letters but bereft of any context. King’s words come from a long, public interview conducted by Rabbi Everett Gendler at the 68th annual convention of the Rabbinical Society on March 25, 1968 — ten days before his assassination and ten months after the War. Revisiting it is highly instructive. First, Gendler tried to cajole him into denouncing “anti-Semitic and anti-Israel Negroes.” But King pushed back. Dismissing the claim that anti-Semitism was rampant in the Black movement, he argued instead that Black-Jewish tensions stem primarily from economic inequality and exploitation. He implored the audience “to condemn injustice wherever it exists. We found injustices in the black community . . . And we condemn them. I think when we find examples of exploitation, it must be admitted. That must be done in the Jewish community too.” In other words, King not only insisted on condemning all forms of injustice but he refused to allow the charge of anti-Semitism to silence legitimate criticism — of Jews or of Israel. We can only speculate on how King’s position may have changed had he lived, but given the opportunity to study the situation in the same way he had studied Vietnam, he would have been less sanguine about Israel’s democratic promise or the prospect of international aid as a strategy to dislodge a colonial relationship. To be sure, his unequivocal opposition to violence, colonialism, racism, and militarism would have made him an incisive critic of Israel’s current policies. He certainly would have stood in opposition to the VLG, CUFI, and the litany of lobbyists who invoke King as they do Israel’s bidding. And let’s be clear: King preached revolution. Distributing humanitarian aid and ending hostilities were never the endgame. The point of civil disobedience was not to keep the status quo intact, to make the regime slightly more just or fairer. The point was to overturn it. More than a regime change, King called for a revolution in values, a rejection of militarism, racism, and materialism, and the making of a new society based on community, mutuality, and love. Not surprisingly, I found this revolutionary commitment to build a new society in Palestine. Yes, I confronted the apartheid Wall, witnessed the harassment of Palestinians passing through checkpoints, wept over piles of rubble where Palestinian homes had been demolished and their olive trees uprooted by the IDF, walked through the souk in Hebron littered with bricks and garbage and human feces dumped on Palestinian merchants by settlers, negotiated the narrow, muddy pathways separating overcrowded multistoried shacks in the refugee camps erected in the shadows of fortress-like West Bank settlements, and was overwhelmed by the level of violence, repression, and dehumanization Palestinians had to endure. But what impressed me most were the activists, the intellectuals, the youth, who spoke confidently about a liberated country, who saw the old guard leadership and the Palestinian Authority as impediments, who envisioned and debated a dozen different paths to a democratic and decolonized future. They gathered at Muwatin: the Palestinian Institute for the Study of Democracy in Ramallah; at Mada al-Carmel: the Arab Center for Applied Social Research in Haifa; and in the refugee camps in Balata, Jenin, and Bethlehem. Singing for freedom in our hearts. The same vision of revolution is evident among the young activists in Ferguson, Missouri. They, too, remind us that Black struggle matters. It matters because we are still grappling with the consequences of settler colonialism, racial capitalism, and patriarchy in the US. It mattered in post-Katrina New Orleans, a key battleground in neoliberalism’s unrelenting war on mostly Black, Latino, Vietnamese, and Indigenous working people, where Black organizers lead multiracial coalitions to resist the privatization of schools, hospitals, public transit, public housing, and the dismantling of public sector unions. The young people of Ferguson struggle relentlessly, not just to win justice for Mike Brown or to end police misconduct but to dismantle racism once and for all, to bring down the Empire, and to ultimately end War. As they reach out to Palestine, and Palestine reaches back to Ferguson, the potential for a new basis for solidarity is being born — one rooted in revolution.